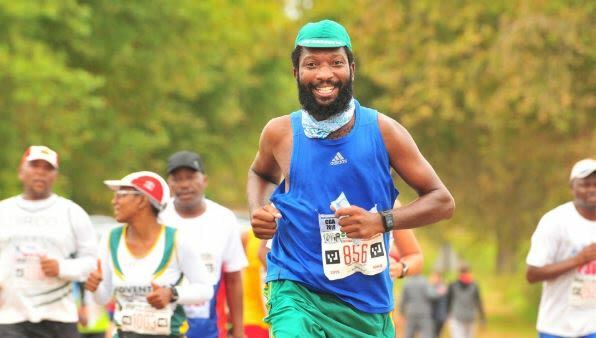 LeadSA Hero, Mavhuthu Dzege prepares to run his first ever Comrades Marathon in June to raise awareness for prostate cancer and sanitary pad donations. He is running the Two oceans marathon as part of his Comrades prep. Dzege decided to raise prostate cancer awareness with his race entry after his father was diagnosed with the disease. He has also chosen to highlight the increasing need for available sanity pads to keep girls in school. Another passion of his is collecting and donating school shoes to underprivileged children around Gauteng and he raises funds to buy new school shoes for children. Dzege endured pain and suffering running a race barefoot in 2018 to create awareness about the long distance that a lot of underprivileged children walk to school. Sometimes you just have to forget about yourself, to share and give hope to someone else, even if they are a complete stranger! And his readiness for Comrades? I have mixed emotions about the race. I am scared and ready for it at the same time. It’s a challenge that puts your mental and physical strength to the test. What you utter to yourself before, during and after the race, will change you forever! Thando Malepe, from NGO The Character Company, is competing in the Old Mutual Two Oceans Marathon this weekend to help the organisation raise funds to sponsor holiday camps for boys as it has limited resources. As a first time runner, the feeling is awesome, to race on the year that they celebrate their 50th anniversary. I am also honoured to take part in the Old Mutual Two Oceans Marathon on behalf of The Character Company. Make your donation for The Character Company here.